Amid intensified Western sanctions on Russia and tumbling global energy prices, the Russian financial system is undergoing enormous difficulties. Its accelerating capital flight has led to a steep drop in the value of the Russian ruble, and meanwhile, its fiscal revenue has considerably decreased due to the plunge in oil prices. In this context, China's extensive investment in Russia has drawn much attention. China now holds Russian bonds and exchangeable monetary assets and also makes direct investments in Russia. Some observers hold that as the Russian economy is now in a harder position, risks increase for Chinese investment. If massive losses occur, it will in turn affect the safety of Chinese financial institutions and may even spark a systemic crisis, they say. Should we worry about being implicated in the difficulties of Russian finance? All investment involves risk. International investment in particular involves special risks that result from political, price and contract default factors. While it's necessary to watch these risks, more attention is needed on strategic interests. Russia is a strategic collaborative partner of China and naturally deserves China's help. In the international landscape, China is under a lot of strategic pressure and needs to stabilize its strategic partner to share the burden. To this end, China's helping a strategic partner is somewhat helping itself. When some eurozone countries were disturbed by the sovereign debt crisis, it was China that acquired their bonds to help stabilize their markets. However, in the aftermath of the crisis when these bonds appreciated dramatically, some Western investors even came to China in hope of buying back the bonds that they had tried hard to avoid. Didn't they know that things always change? Such is the case with China's investment in Russia, as it will definitely appreciate when the Russian economy has passed through its difficulties and the world economy returns to the growth track. As an important part of the global economy, China's decisions will affect the way that things proceed. Where China deploys its over $4 trillion foreign exchange reserves would hence exert a tremendous influence on the global market, which provides a greater security guarantee for China's financial system. It is businesspeople that haggle over the returns of every investment deal while strategists always eye the ultimate strategic gains. 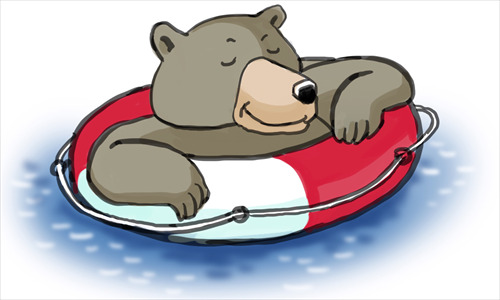 China can only stay stable with stability in Russia ensured. In this case, giving a hand to Russia is also helping China itself. What will China encounter on the international stage if it lets Western countries heighten sanctions on Russia and drag the country into chaos? What kind of cost will China have to pay for this? This cannot be matched against the losses that China may suffer in its investment in Russia. On the other hand, if China's help earns Russia's trust and makes it a reliable energy and resource supplier as well as a military strategic partner, how much would such a deal be worth?